A central component of justice is how the economic goods are distributed in a society. Philosophers contribute to distributive justice debates by providing arguments for principles to guide and evaluate the allocation of economic goods and to guide the design of institutions to achieve more just distributions. This volume includes both seminal and recent work by philosophers, covering a range of representative positions, including libertarian, egalitarian, desert, and welfare theorists. The introduction to the volume and the selections themselves are designed to allow students and professionals to see some of the most influential pieces that have shaped the field, as well as some key critics of these positions. The articles intersect in such a way as to develop an appreciation of the types of theories and the central issues addressed by theories of distributive justice. Furthermore, the choice of authors in this collection reflects an appreciation of the influence of institutions in general, markets in particular, and even luck on the distribution of economic goods. Contents: Introduction; Part I Right Libertarianism and Its Critics: Distributive justice, Robert Nozick; Robert Nozick and Wilt Chamberlain: how patterns preserve liberty, G.A. Cohen; Self-ownership, world-ownership, and equality, G.A. Cohen; Taking responsibility, David Schmidtz. 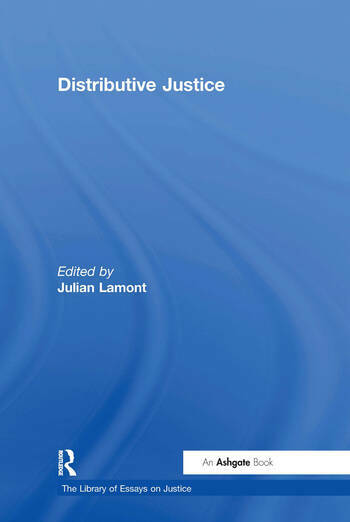 Part II Distributive Justice, Fairness and Equality: Distributive justice: what the people think, David Miller; A critical introduction to Rawls' theory of justice, Allen Buchanan; Equal opportunity and moral arbitrariness, Brian Barry; Egalitarian opportunities, Marc Fleurbaey; Complex equality, Michael Walzer. Part III Desert, Distributive Justice and the Market: Distributive justice, David Miller; Justice under capitalism, Jonathan Riley; Incentive income, deserved income, and economic rents, Julian Lamont. Part IV Welfarism and Needs: A skeletal theory of institutions, James Wood Bailey; Basic distributive institutions, James Wood Bailey; Why all welfare states (including laissez-faire ones) are unreasonable, Gerald F. Gaus; Why surfers should be fed: the liberal case for an unconditional basic income, Philippe Van Parijs; The right to an adequate standard of living: justice, autonomy, and the basic needs, David Copp; Name index.